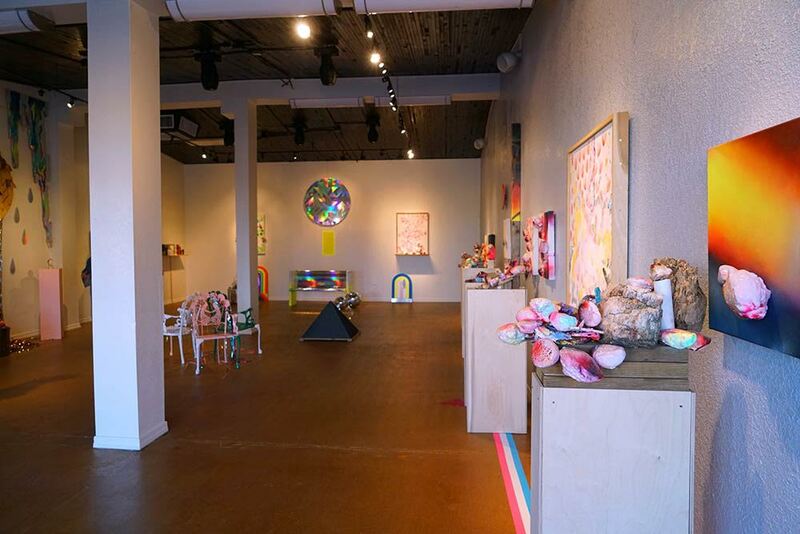 Mark Freedman and Lisa von Hoffner curated and installed a new place for the artistically curious. It was The Memphis Rainbow Parlour, and visitoris felt lifted up and energized during and after their visit. The lively colors, pleasing lines, natural found objects, and human-made organic forms, coalesced into a new creation. These classically trained artists partnered to create a parlor inspired by the Italian Memphis Design Group, the parlors and salons of Versailles, and their own passion for color and shine. Freedman creates fabricated artifacts which "celebrate the classic beauty of human endeavor and the ephemeral beauty of human life." Von Hoffner uses visual hyperbole to help the viewer disengage from self and enjoy a moment of the infinite. Together their efforts encourage visitors to inhabit an ephemeral space filled with instances of infinity.